By Keith Cowing on May 31, 2017 3:28 PM. "Stratolaunch CEO Jean Floyd said the plane's emergence from its hangar at California's Mojave Air and Space Port was part of a "major milestone in its journey toward providing convenient, reliable and routine access to low Earth orbit." The plane is designed to carry up to three Orbital ATK Pegasus XL rockets at a time into the air, and then set them loose to launch payloads into orbit. .. Stratolaunch says the first launch demonstration, involving a single Pegasus XL, will take place as early as 2019." 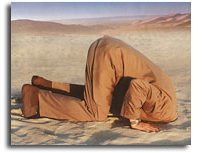 Keith's note: So ... when will they announce that they have found a commercially viable reason to launch Dream Chaser? By Keith Cowing on May 31, 2017 2:36 PM. "Governor A. Okoloise passed away on Sunday, May 21, 2017 at age 49. His family came to America from Nigeria when he was a boy. Gov, as we called him, worked at Johnson Space Center for the past 24 years. A dedicated space worker, he certified space life sciences and exercise hardware throughout the 90s. Most recently, he was responsible for the design, assembly and safety of the EMU Space suit and hardware used during ISS space walks (EVA). He was a congenial and personable friend to everyone, going out of his way to help others as much as possible." By Keith Cowing on May 31, 2017 10:24 AM. "Although the company has never placed a hard dollar value on the Dragon, the savings could be considerable. SpaceX received a contract worth $1.6 billion from NASA for 12 cargo supply missions to the station in 2008--about $130 million per flight. That would have included the cost of the booster, of course, so therefore an individual Dragon spacecraft is likely valued at between $20 million to $60 million." By Keith Cowing on May 29, 2017 12:50 PM. "Matthew found inspiration in Carl Sagan's words, "Somewhere, something incredible is waiting to be known." Matthew's invaluable contributions to the field of commercial spaceflight included working at Astranis, Planetary Resources, the Commercial Spaceflight Federation, Space Adventures, SpaceX, and the XPRIZE Foundation. He was loved by so many and will be greatly missed." Keith's note: I am just startled and shattered by this. Matt was only 29 and yet was everything you wanted in a space explorer and crammed so much into his all too short life. He was smart, bubbling with enthusiasm, and always ready to tackle a new challenge. I first met Matt in May 2002 at the AIA rocket launch competition here in Virginia. I went to hear Sean O'Keefe officiate at the competition - his father Steve worked for O'Keefe at the time. My initial impression of Matt came when I spotted his father with several kids in tow. Due to the recent rain we were all covered in mud to some extent. Matt was still a young boy and I recall that he was clearly excited by all of the rocket launches he was seeing. Matt was also somewhat impatient with his father and clearly wanted him to dispense with saying hello to O'Keefe and I and get back to the rockets. Over the years I'd see Matt regularly and watched him become quite the space professional. Despite his age, he was fun to debate issues with since he actually knew what he was talking about. Matt was one of those people whose accomplishments I had expected to read about in my old age. Ad Astra. "Matthew Isakowitz was an extraordinary young man whose passion for opening the commercial space frontier was only matched by his kindness and generosity to those around him. In his honor and memory, we are participating in an initiative to support the space-related programs that were so dear to him. Your donations will be applied toward a to-be-announced initiative that will further Matthew's legacy in the field of human space exploration." By Keith Cowing on May 27, 2017 11:02 AM. "Q: Does NASA pay $18,000 for people to stay in bed and smoke weed for 70 straight days? A: No. NASA conducts bed-rest studies, but it does not allow participants to smoke marijuana or even drink alcohol." Facebook users flagged a story with the captivating headline "NASA Will Pay You $18,000 To Stay In Bed And Smoke Weed For 70 Straight Days." Don't get too excited. It's false." By Keith Cowing on May 25, 2017 9:08 AM. "Rocket Lab broke new ground today when its Electron rocket reached space at 16:23 NZST. Electron lifted-off at 16:20 NZST from Rocket Lab Launch Complex 1 on the Mahia Peninsula in New Zealand. It was the first orbital-class rocket launched from from a private launch site in the world. "It was a great flight. We had a great first stage burn, stage separation, second stage ignition and fairing separation. We didn't quite reach orbit and we'll be investigating why, however reaching space in our first test puts us in an incredibly strong position to accelerate the commercial phase of our programme, deliver our customers to orbit and make space open for business," says Beck." By Keith Cowing on May 24, 2017 12:39 PM. "Boeing will develop an autonomous, reusable spaceplane capable of carrying and deploying a small expendable upper stage to launch small (3,000 pound/1,361 kg) satellites into low Earth orbit. Boeing and DARPA will jointly invest in the development. Once the spaceplane - called Phantom Express - reaches the edge of space, it would deploy the second stage and return to Earth. It would then land on a runway to be prepared for its next flight by applying operation and maintenance principles similar to modern aircraft." By Keith Cowing on May 23, 2017 5:52 PM. Keith's note: This is kind of strange. If the intent for the NASA Education Office was to do something "NASA-wide" then you'd think that an agency-wide organization/approach would be needed for that. This is what the NASA Education Office has done for decades. But instead of thinking agency-wide and fixing the NASA Education Office they have decided to close the agency-wide Education Office and shove the remnants inside of the Science Mission Directorate. When I asked Acting NASA CFO Andrew Hunter about this he said that NASA does not have a response to this issue and that Acting Education Office AA Mike Kincaid is working on that. So, in other words, they are shutting down the Education Office - without any plan to do all of what the Education Office has been doing for several generations. Hunter and (earlier today) Robert Lightfoot both went off on the whole "inspring the next generation" thing and rambled on about websites and social media - most of which is not paid for by NASA Education office but rather by NASA PAO or the mission directorates. Yet somehow we are supposed to think that doing less education stuff can actually result in more inspiring of the next generation. But wait: Hunter thinks Congress will add things back. So why delete things in the first place if you expect them to be put back? By Keith Cowing on May 23, 2017 3:34 PM. "This hearing will examine U.S. government obligations under the Outer Space Treaty on its 50th anniversary, specifically compliance with Article VI of the Treaty that requires governments to authorize and continually supervise the activities of non-government entities. This hearing will also explore the Treaty's potential impacts on expansion of our nation's commerce and settlement in space." By Keith Cowing on May 23, 2017 12:49 PM. By Keith Cowing on May 23, 2017 12:22 PM. "While this budget no longer supports the formal Office of Education, NASA will continue to inspire the next generation through its missions and the many ways that our work excites and encourages discovery by learners and educators. Let me tell you, we are as committed to inspiring the next generation as ever. We're going to engage the public in the compelling story of exploration by the successful and safe execution of our missions, which is where our focus has to be. At the same time, we're going to take this opportunity for NASA to revisit the public engagement and outreach activities that take place on the ground at centers every day to ensure that we are leveraging the synergies between education and outreach to facilitate meaningful connections." Keith's note: In other words the White House thinks that NASA no longer needs an education office - after half a century of having one -- and that reducing funding for education and outreach will somehow cause more education and public outreach to be accomplished. "While we are not proposing to move forward with Orbiting Carbon Observatory-3 (OCO-3), Plankton, Aerosol, Cloud, ocean Ecosystem (PACE), Climate Absolute Radiance and Refractivity Observatory Pathfinder (CLARREO PF), and the Radiation Budget Instrument (RBI), this budget still includes significant Earth Science efforts, including 18 Earth observing missions in space as well as airborne missions." Saying that you are still doing some earth science while multiple cutting climate science missions is akin to saying "be thankful that we did not cut all of it." "We have a budget that also provides the necessary resources in the coming year to support our plans to send humans to Mars orbit in the 2030s. The European service module will be delivered to the Kennedy Space Center for integration with Orion in 2018. Prototype ground testing of habitat modules under our broad area announcement activity will happen in 2018." NASA still has nowhere near the funding or anything close to the required strategic planning needed to send human to Mars in the 2030's and the Trump Administration is willing to continue the charade initiated by the Obama Administration while further undercutting the agency's ability to actually attempt to do these tasks. And of course, Congress will reverse all of the things proposed in this budget - again. By Keith Cowing on May 23, 2017 9:33 AM. "Lightfoot will give a presentation at 12:30 p.m. EDT to NASA employees at the agency's Headquarters in Washington on FY2018 budget highlights, setting the stage for the coming year at NASA and spotlighting the past work that led to current achievements. This presentation will air live on NASA Television and the agency's website." "The President's 2018 Budget requests $19.1 billion for NASA, a 0.8 percent decrease from the 2017 annualized CR level, with targeted increases consistent with the President's priorities. ... Supports and expands public-private partnerships as the foundation of future U.S. civilian space efforts. The Budget creates new opportunities for collaboration with industry on space station operations, supports public-private partnerships for deep-space habitation and exploration systems, funds data buys from companies operating small satellite constellations, and supports work with industry to develop and commercialize new space technologies." "Eliminates the $115 million Office of Education, resulting in a more focused education effort through NASA's Science Mission Directorate. The Office of Education has experienced significant challenges in implementing a NASA-wide education strategy and is performing functions that are duplicative of other parts of the agency." "Today, U.S. Senators Tim Kaine (D-VA) and Tammy Baldwin (D-WI), co-chairs of the Senate Career and Technical Education (CTE) Caucus, are leading a group of 32 Senators in a letter urging the Senate Appropriations Committee to support NASA's Office of Education in the coming fiscal year." "So NASA does not actually operate instruments on DSCOVR - NOAA does - but OMB wants NASA to "terminate" them anyway. And the money saved annually for NASA data analysis? $1.7 million. The cost for a single trip to Mar-a-Lago? $3 million. Priceless." By Keith Cowing on May 23, 2017 9:00 AM. "NASA will hold a series of events Tuesday, May 23, highlighting the agency's Fiscal Year 2018 budget proposal, including a televised State of NASA address by acting Administrator Robert Lightfoot." Keith's note: Earlier this year the White House put forth a budget that cut many things at NASA - thus allowing it to barely tread water. Then Congress responded and NASA's budget picture dramatically improved - but only until 30 September 2017. Now the White House is issuing another budget proposal - this time for FY 2018. Once again the NASA budget is lacking in many ways. It also seeks to pick a fight with appropriators by eliminating the Europa missions that Rep. Culberson included - missions that NASA is required to conduct by law. We've seen this movie before. NASA will be required to act in lock step with the White House and promote this latest budget request - even if it does damage to NASA programs. Right now NASA is hobbled by the lack of a confirmed Administrator with the top slots at the agency run by people in acting positions and some transition team holdovers. 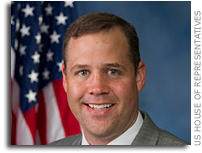 It is expected that Rep. Bridenstine will be nominated to head NASA within the coming days. Once he is confirmed (which may take a while due to ongoing White House distractions) Bridenstine is going to have to get a deputy with actual experience running a large, technically-oriented government R&D agency. He is also going to have to staff the 9th floor at NASA HQ with people who are similarly skilled - and not just rely upon 2016 campaign staffers who got a job simply as a reward for their loyalty. The two budgets that the White House has submitted to Congress do little - if anything - to help NASA fund all of the things on its to-do list. To be certain, not cutting NASA earlier this year when other agencies were targeted for draconian cuts was an indication of some minimal support for NASA. However, the potential for NASA budget growth was all but non-existent. That said, the large programs NASA still wants to do i.e. SLS/Orion to Mars, the Lunar Gateway, etc. are increasingly underfunded and behind schedule. Despite promises of a new breath of commercial space thinking in the way NASA does things, the presence of Newt Gingrich and Bob Walker in the wings has not made any noticeable change in NASA priorities - at least not yet. That may come when Scott Pace shows up for work at the National Space Council. But any coordinated policy formulation at the Space Council is going to take a long time to be translated into guidance for Administration budget requests. In the mean time NASA is going to have to send its envoys to Congress to say that the President's budget cuts are good while simultaneously explaining why it does not have the money for the things Congress has told NASA to do. This is going to happen across the Federal government. Congress already spurned the earlier FY 2017 budget request from the White House. Congress will almost certainly do the same thing with the request for FY 2018. When all is said and done NASA's portfolio under the Trump Administration is going to look exactly like the Obama Administration's portfolio: Strategically scattered, chronically inefficient, and woefully underfunded. By Keith Cowing on May 22, 2017 11:58 AM. "The Environmental Protection Agency plans to set aside $12 million for buyouts and early retirements in coming months, as part of an effort to begin "reshaping" the agency's workforce under the Trump administration." "While final budget decisions are to be negotiated in the months ahead with Congress, a recent OMB memo on restructuring agencies and cutting federal jobs told agencies to assume that those proposals will be approved. It also promised quick consideration of early out and buyout requests, although it did not recommend either for or against using them." "It's happened before; lawmakers and think tanks have offered their own proposals to change the federal retirement system. Despite a few initial worries, current federal employees and retirees have remained relatively unscathed. Yet that could change next year. Federal financial experts are sounding the alarm bells on the major changes to the federal retirement system included in President Donald Trump's fiscal 2018 budget -- proposals that they say would leave a significant impact on both current retirees and employees and future workers." By Keith Cowing on May 22, 2017 11:50 AM. "Astronauts Peggy Whitson and Jack Fischer are getting ready for a contingency spacewalk Tuesday morning. Whitson and Fischer are set to begin the spacewalk at 8 a.m. Tuesday for about two hours of maintenance work. The spacewalk's primary task is the removal and replacement of a data relay box, known as a Multiplexer-Demultiplexer (MDM), which failed Saturday morning. The MDM controls the functionality of station components such as the solar arrays, radiators, cooling loops and other systems." By Keith Cowing on May 19, 2017 7:33 PM. "The spreadsheet suggests that most major NASA accounts will see cuts compared to what Congress provided in the fiscal year 2017 omnibus spending bill enacted earlier this month, which gave NASA $19.653 billion overall. Science would receive a little more than $5.71 billion, $53 million less than what it received in 2017." By Keith Cowing on May 19, 2017 9:19 AM. Keith's note: Reading NASAWatch you might think that this site has a preoccupation with clumsy projects (like SLS) that are over budget, behind schedule, and lacking in terms of mission focus. That is not representative of NASA as a whole. Here is one example - I saw this article in Science last week and thought that this research was worth re-featuring - especially given that a bunch of science is headed for ISS in a week or so. When I worked at NASA helping to design Space Station Freedom, my focus was life and materials science payloads. These little DNA sequencing devices (which will fit in your pocket) were impossible back then - and if they were, would have required several payload racks and a lot of power and crew time. While NASA has problems with its rockets, payload technology is moving ahead at warp speed. "Aaron Burton, an astrobiologist at NASA's Johnson Space Center in Houston, Texas, who is exploring how nanopore devices could help search for life elsewhere in the solar system, agrees: "The rapid improvements have made it a viable technology right now, rather than an emerging technology that 'could be good in a few years.'" ... MinION's portability continues to prove its value. With the aid of warming packs that kept the machine's chemistry working, Sarah Johnson, a planetary scientist at Georgetown University in Washington, D.C., used one to generate long reads of DNA while collecting specimens in an Antarctic dry valley, a setting sometimes used as a proxy for Mars." "NASA is not often known for making the best use of existing COTS (commercial off the shelf technology) aboard the ISS. Then again, sometimes they are. This is an example of when the agency really grabs cutting edge biotech and sends it into space. There's usually quite a lag time. The reasons range from slogging through the often cumbersome payload safety and integration process to people at NASA who are simply not up to date with what the ral world is doing in their field. In this instance a rather remarkable gizmo is being flown in space that truly puts genetic sequencing in the palm of your hand. Indeed, its almost as if NASA was flying part of a version 1.0 Tricorder in space. This is cutting edge technology folks." By Keith Cowing on May 18, 2017 3:20 PM. "Last December, an astronaut with NASA was fired for submitting over $1,600 in fake reimbursements for taxis they didn't take. And strangely enough, we don't know who it is. ... In the end, the NASA OIG office suggested something that has been redacted (we're going to guess termination, but who knows?) and the astronaut ultimately resigned at some point in December 2016. Curiously, the exact date of resignation has also been redacted." Keith's note: (sigh) Gizmodo can't make up their mind. "Fired", "Termination", "Resigned"? Pick one. Oh wait - the OIG says that the astronaut "resigned". While the end result is more or less the same (the astronaut no longer works at NASA) resigning is not the same as being "fired" or "terminated". People get caught at NASA doing lots of things and they often keep their jobs. As to who the astronaut is, well ... check out this press release which refers to an astronaut who retired in December 2016: "Astronaut Cady Coleman Leaves NASA". My sources tell me that Cady Coleman is indeed the astronaut mentioned by the OIG. This was not exactly a secret at NASA HQ over the past few months. I was not going to say anything - until I read the FOIA response that Gizmodo got. I'm sort of at a loss for words. Think of the millions of people who'd love to be a NASA astronaut - and then this is how one of them throws away that job. By Keith Cowing on May 18, 2017 9:08 AM. Keith's note: Sources continue to report that Rep. Jim Bridenstine (R-OK) is still the Administration's preferred choice to become NASA Administrator and that they expect to nominate him in the coming weeks. Former Rep. Bob Walker stated several weeks ago in a public event that the executive order creating (reinstating) the National Space Council has been drafted and that it is awaiting signature. The only thing holding that executive order up is identifying an Executive Secretary for the National Space Council. Sources report that the odds-on favorite for that position is veteran space policy expert Scott Pace. Right now routine matters such as these positions are at the mercy of the growing chaos at the White House. Then, of course, once Bridenstine is nominated the issue of his confirmation arises and the same White House chaos - and Congress' response to it - is likely to drag out routine business even further. Once this all settles out you can expect a change in the composition of Trump political appointees at NASA HQ as well - so hang in there folks. By Keith Cowing on May 17, 2017 9:44 PM. "Many major Department of Defense (DOD) space programs GAO reviewed have experienced cost and schedule increases. For example, costs for the Advanced Extremely High Frequency satellite program grew 118 percent and its first satellite was launched more than 3.5 years late. Costs for the Space Based Infrared System grew nearly 300 percent and its scheduled launch was delayed roughly 9 years. Both programs are now in the production phase during which fewer technical problems tend to surface. Satellite ground systems have also been challenged by cost and schedule growth. In fact, ground system delays have been so lengthy that satellites sometimes spend years in orbit before key capabilities can be fully utilized." By Keith Cowing on May 17, 2017 8:48 PM. "Today, U.S. Senators Tim Kaine (D-VA) and Tammy Baldwin (D-WI), co-chairs of the Senate Career and Technical Education (CTE) Caucus, are leading a group of 32 Senators in a letter urging the Senate Appropriations Committee to support NASA's Office of Education in the coming fiscal year. President Trump's budget proposal for Fiscal Year 2018 (FY18) would eliminate NASA's Office of Education, which works to inspire and educate students across the country to pursue careers in science, technology, engineering, and math (STEM). In Virginia, funding from NASA's Office of Education enables students to explore careers in STEM-related fields at NASA Langley, NASA Wallops, and in Virginia's robust technology sector." By Keith Cowing on May 17, 2017 3:02 PM. "Legally, there is nothing to stop the Trump administration from appointing anybody it likes to agency science boards. The Federal Advisory Committee Act (FACA), which governs most of them, does not spell out qualifications for membership. (Some committees such as the EPA's Clean Air Scientific Advisory Committee are governed by their own statutes with stricter service rules.) "All FACA says is you need 'balanced representation'. It says nothing about conflicts of interest or scientific integrity," Wagner says. "If you wanted science advisory boards stripped down, with minimal constraints, anything goes, legally you could do that." "Both the Environmental Protection Agency and the Interior Department are overhauling a slew of outside advisory boards that inform how their agencies assess the science underpinning policies, the first step in a broader effort by Republicans to change the way the federal government evaluates the scientific basis for its regulations. EPA Administrator Scott Pruitt decided to replace half of the members on one of its key scientific review boards, while Interior Secretary Ryan Zinke is "reviewing the charter and charge" of more than 200 advisory boards, committees and other entities both within and outside his department. EPA and Interior officials began informing current members of the move Friday, and notifications continued over the weekend." Keith's note: Of course, this purge will eventually reach NASA as well - starting with the NASA Advisory Council. Stay tuned. By Keith Cowing on May 17, 2017 11:18 AM. "In an attempt to meet a 2017 launch date for the SLS, NASA expedited construction of the test stands and paid the contractor a premium of approximately $7.6 million to complete construction on a compressed timetable. Moreover, because the stand designs were based on preliminary testing specifications, the requirements and testing capabilities that would be needed were not fully understood when the construction contract was awarded. As the testing requirements matured, NASA modified the contract to meet changing requirements, added additional features, and made other modifications that raised the contract price by $20.3 million. In addition, NASA did not establish adequate funding reserves to cover these changes and therefore had to secure $35.5 million in additional funding over the planned budget. Finally, because NASA did not adequately consider alternative locations before selecting Marshall as the site for the test stands, it cannot ensure it made the most cost-effective decision regarding where to build the stands." "In July 2008, the NASA Office of Inspector General (OIG) examined allegations that NASA's plan to build the A-3 test stand at Stennis to test its J-2X engine would duplicate capabilities of an Air Force testing facility in Tennessee. The OIG found NASA failed to follow both its own internal procedures and the process it had agreed to with the Department of Defense (DOD) to avoid costly duplication of test stands when making decisions where to test rocket engines." By Keith Cowing on May 17, 2017 9:15 AM. By Keith Cowing on May 16, 2017 6:02 PM. Keith's 16 May update: According to NASA PAO there is "no Orion program interest in buying another Delta". That said there have been meetings at NASA where this was openly discussed - since I have spoken to people who have been in those meetings. What constitutes "program interest" means different things to different people. If there is no interest in the topic then why do they talk about it at meetings? Keith's 15 May note: Sources within NASA report that there is interest in buying another Delta IV Heavy for an Orion mission. NASA launched the first Orion mission - EFT-1 on a Delta IV Heavy in 2014. Speculation about the interest in another Orion flight on a Delta IV Heavy often surfaces with an expression of doubt with regard to the future viability of SLS and whether it will be used to loft human crews. Some have suggested that Lockheed Martin may propose an Orion variant for a future commercial crew procurement opportunity. Congress has also expressed renewed interest in Orion visits to ISS and put language into the NASA Transition Authorization Act of 2017 addressed "the ability of Orion to meet the needs and the minimum capability requirements described in section 303(b)(3) of the National Aeronautics and Space Administration Authorization Act of 2010." NASA was supposed to deliver a report to Congress within 60 days of the bill becoming law - which means that the report is past due. Oh yes: Delta IV Heavy is not human rated - yet. Stay tuned. By Keith Cowing on May 16, 2017 12:30 PM. "Three of the largest projects in this critical stage of development-- Exploration Ground Systems, Orion, and the Space Launch System-- continue to face cost, schedule, and technical risks. In April 2017, we found that the first integrated test flight of these systems, known as Exploration Mission-1, will likely be delayed beyond November 2018.14 NASA concurred with our findings and is currently conducting an assessment to establish a new launch date. Because NASA's assessment is ongoing, the cost implications of the schedule delay and its effect on the projects' baselines are still unknown. However, given that these three human space exploration programs represent more than half of NASA's current portfolio development cost baseline, a cost increase or delay could have substantial repercussions not only for these programs but NASA's entire portfolio." By Keith Cowing on May 16, 2017 10:53 AM. "[Sid Bowdidge, a Trump campaign staffer] pointed out that other Trump campaign staffers had been the subject of unflattering leaks. Among them: Danny Tiso, a Labor Department appointee, whose academic history has come under scrutiny, and Jonathan Dimock, a NASA staffer whose work background has been put under the microscope." "President Trump may be adding to his administration's challenges by picking someone without a science background to head the U.S. Department of Agriculture's (USDA's) research programs, former agriculture secretary Dan Glickman said today. The Clinton administration official told E&E News that, while he doesn't know Sam Clovis - reported to be Trump's pick for undersecretary for research, education and economics - scientific knowledge is especially useful in a position that requires coordination with scientific agencies within the government." By Keith Cowing on May 15, 2017 9:01 PM. Keith's note: Dwayne Day works at the National Academy of Sciences - where experts review our nation's science and technology programs. Its a rather prestigious place. As best I can tell all Dwayne has ever done there is to sit in the corner in rooms full of smart people and write down what they say. Dwayne apparently thinks this gives him the chops to sit in judgement of someone like Buzz Aldrin. In this posting Dwayne Day goes on a lengthy tirade full of gratuitous cheap shots and insults aimed squarely at making Buzz look foolish. We all know Buzz. We all love Buzz. And Buzz will always be Buzz. But for an employee of the National Academy of Sciences (or anyone else) to mount such a public attack against an 87 year old American legend is simply inexcusable. I wonder what the senior scientists who sit on NAS panels would think if they knew what Dwayne Day says about another senior citizen - Buzz Aldrin. By Keith Cowing on May 15, 2017 12:00 PM. Keith's note: Sources report that NASA is looking at using the EM-2 SLS launch vehicle for the EM-1 mission due to hydrogen tank issues on the EM-1 vehicle. NASA is also looking at using the EM-3 SLS launch vehicle to fly the EM-2 mission. In addition, NASA is considering a delay in issuing the SLS block buy procurement notice (EM-3 and beyond) originally due out in June into Oct 2017 i.e. pushing its issuance into FY 2018. No one knows that NASA's budget will be for FY 2018. Stay tuned. By Keith Cowing on May 15, 2017 9:43 AM. We lost a set of powerpack test hardware on one of our BE-4 test stands yesterday. Not unusual during development. By Keith Cowing on May 14, 2017 11:20 AM. "About 10 days ago, a founding employee of SpaceX, Tom Mueller, made a Skype call to a group of "fans" of the company with the New York University Astronomy Society. The call was recorded and posted to Twitch.tv. It garnered little attention until Saturday, when a user on the SpaceX subreddit called attention to it. Although the provenance of the 54-minute call is not entirely clear, there is no question it is Mueller speaking, and he is doing so in a rare, unfiltered way. ... This call is reminiscent of remarks made a little more than a year ago by a senior-level employee of SpaceX's competitor, United Launch Alliance. During candid remarks at a University of Colorado-Boulder seminar, which Brett Tobey did not know were being recorded, the vice president of engineering said United Launch Alliance could not compete with SpaceX on price. 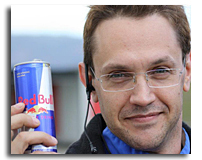 He was terminated almost immediately by the company." By Keith Cowing on May 12, 2017 6:19 PM. 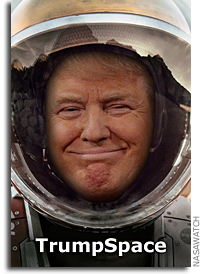 "TRUMP: "Tell me: Mars, what do you see a timing for actually sending humans to Mars? Is there a schedule and when would you see that happening?" WHITSON: "Well, I think as your bill directed, it'll be approximately in the 2030s. As I mentioned, we actually are building hardware to test the new heavy launch vehicle, and this vehicle will take us further than we've ever been away from this planet. "So, unfortunately space flight takes a lot of time and money so getting there will require some international cooperation to get the - it to be a planet-wide approach in order to make it successful just because it is a very expensive endeavor. But it is so worthwhile doing." TRUMP: "Well, we want to try and do it during my first term or, at worst, during my second term, so we'll have to speed that up a little bit, okay?" WHITSON: "We'll do our best." By Keith Cowing on May 12, 2017 5:39 PM. "We are grateful for the near-term flexibility offered by the FY 2017 Consolidated Appropriations Act, and we are confident that we remain technically capable of launching crew on EM-1. However, after evaluating cost, risk, and technical factors in a project of this magnitude, it is difficult to accommodate changes needed for a crewed EM-1 mission at this time." "In the face of political pressure, then, NASA chose prudence. Yet the evidently shrewd short-term decision to hold crew off the maiden flight of the SLS rocket could not mask a larger political problem that NASA has grappled with for nearly this entire decade. Simply, it has been tasked with building a massive, complicated rocket that it can't really afford." "By the end of the next fiscal year on September 30, 2018, NASA will have spent $23 billion on the rocket, capsule, launch site and support systems, according to an audit by NASA's Office of Inspector General. That excludes $9 billion spent on the mothballed Constellation lunar exploration program, which included initial development of the Orion and a second heavy-lift rocket." "We're essentially building a multi-decadal infrastructure that allows us to move the human presence into the solar system," [William] Gerstenmaier said. The commercial space sector - including SpaceX, founded by Elon Musk, and Blue Origin, owned by Jeffrey P. Bezos (who also owns The Washington Post) - is racing to develop its own rockets that are comparable in scale to the SLS. "This really isn't about NASA vs. SpaceX, or NASA vs. Blue Origin, it's more about the past way of doing business vs. how do we run the government more like a business," [Phil] Larson said." Keith's 11 May note: This is not going to position NASA in a good place. Safety issues not withstanding, NASA has big, chronic delays with the overall SLS program. Then the SLS software program is shown to be bogus. Then they have welding issues. Then they drop the LOX dome. Now there is no way to do EM-1 without money that will never be there. And even if the money was there the existing slip would simply be magnified by attempts to human-rate the SLS to be used for EM-1, bring Orion systems forward etc. There are not enough people or capacity to take the extra money even if it was there. Slipping to late 2019 is just going to give fuel to those who think that there are SLS alternatives i.e. commercial. SLS is not necessarily dead, but the chance that humans will ever fly on it are becoming increasingly remote. At best, one might expect a batch order for a half dozen or so planetary missions or large cargo launches so as to save face and do something with the immense investment made in the whole AresV/SLS thing. If Trump wants NASA to go to Mars while he is still in office he is going to need a Plan B. But Boeing and SpaceX would have to show that they are up to the task since they have been slipping launch dates too. Keith's 12 May additional note: At the end of the day this is all about risk - engineering, programatic, and human. Dealing with risk takes time and time = money. There comes a point when the time/money you need to retire added risk exceeds the benefits that come with adding that new risk. That seems to be the case with the EM-1 crew exercise. Trying to retire risk atop a program that is already struggling to reduce risk is just asking for trouble - and the unlearning of lessons learned with great difficulty. It would seem that NASA has come to this conclusion - and they would not be making this announcement without coordination with the White House. One would assume that the White House understands the rationale behind this decision to decline putting a crew on EM-1. Continue reading NASA Decides Against Putting Crew On EM-1. By Keith Cowing on May 11, 2017 8:03 AM. "Three members of the House have sent a letter to the Government Accountability Office (GAO) requesting a study on the feasibility of elevating the Federal Aviation Administration's (FAA's) Office of Commercial Space Transportation (FAA/AST) to the Secretary of Transportation's office. Advocates believe that would facilitate getting needed financial and personnel resources to allow the office to fulfill its duties as the commercial space launch business expands." By Keith Cowing on May 10, 2017 7:00 PM. Keith's 1:31 pm EDT note: Sources report that a LOX dome for the SLS under construction was dropped and is damaged beyond repair. The accident also damaged some tooling. There are reportedly enough parts to build a new LOX dome but that is going to affect a lot of schedules. David Beaman is heading up an investigation team. More to follow. Keith's 7:00 pm EDT update: NASA PAO provided this statement: "NASA and Boeing formed independent investigation teams to evaluate an incident that occurred while manufacturing test hardware for the Space Launch System (SLS) rocket at the agency's Michoud Assembly Facility in New Orleans May 3. Initial assessments indicate damage to the rear (aft) dome of a liquid oxygen tank, which is part of the rocket's 212-foot core stage. Assessments are underway to determine the extent of the damage. There were no injuries. As required by protocol, the Vertical Assembly Center tool was shut down and secured. NASA is evaluating next steps to safely resume operations with the VAC." By Keith Cowing on May 10, 2017 1:01 PM. By Keith Cowing on May 10, 2017 12:58 PM. Keith's note: Last night there was a panel at the Humans To Mars Summit about risk and exploration. The panel was moderated by Leonard David and consisted of NAI Director Penny Boston, former astronaut and SMD AA John Grunsfeld, former Google space lead Tiffany Montague, and NASA SMD's Rick Davis. 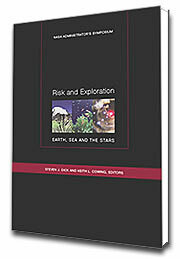 At one point the 2004 Risk and Exploration Symposium that John and I put together back in 2004 was mentioned. The proceedings are online for free download here. I am currently writing two books - one on Astrobiology expeditions and the other as a follow-up to the 2004 Risk and Exploration Symposium (and another we did in 2007 at LSU). For both of my books I have been amassing information on what risks people have taken (on expeditions in space and elsewhere) and how they have been called upon to take these risks. Specifically, I have been focusing on this question: "Would you be willing to deliberately risk your life to discover evidence of life on another world?". Along with that question I'm wondering "Will NASA astronauts bound for Mars be asked to sign waivers with regard to risk as part of overall risk evaluations and informed consent? Will they only be allowed to go if they specifically agree to accept these risks?". Clearly this issue is part of the overall risk assessment that astronauts make albeit somewhat personalized and ad hoc. 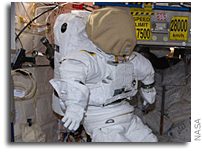 By coincidence John was in orbit in May 2009 taking care of Hubble while another astronaut, Scott Parazynski, did his own risk analysis as he summitted Mt. Everest. I was 2-3 linear miles away from Scott doing education and public outreach for his climb at base camp recovering from an illness that left me with some permanent damage. So ... I think about this topic a lot. As the notion of NASA sending humans to Mars starts to get serious, many more people will need to be thinking along these lines. Matt Damon got back OK in "The Martian". But that was a movie. As I mentioned a few weeks ago when Peggy Whitson broke the U.S. space endurance record. People who engage on expeditions to risky and dangerous places on Earth regularly waive certain safety and medical regulations in order to participate. I have done it more than once in the arctic and at Everest. You consider the risks, weigh the benefits, and then sign the forms. There are lifetime radiation exposure limits for astronauts that are supposed to be used to guide the selection of ISS crews. Now, these limits are apparently subject to selective waiver. So are these "limits" now becoming "guidelines"? Are astronauts now doing something similar to what terrestrial explorers do in order to spend more time in space? What is the process whereby NASA makes this waiver decision? What are the implications for the whole #JourneyToMars thing? Accepting even a small increase in risk be it from radiation, weightlessness, or surface hazards on Mars can have a significant impact on mission design i.e. cost and schedule. Right now cost and schedule are the biggest risk to going to Mars in the first place. By Keith Cowing on May 9, 2017 4:49 PM. Keith's 9 May note: After leaving it online for 4 days with (last time I checked) 525 retweets and more than 200 likes, this tweet easily resulted in millions of Twitter impressions. It was factually wrong, NASA knew it was incorrect, admitted that it was incorrect, but let it stay online all this time, thus deliberately misinforming millions of taxpayers, students etc. This is what the tweet looked like before it was deleted. And of course, @NASA_SLS left their correction online without the original tweet that it was correcting. Go figure.
.@NASA Good catch everybody! Freedom-7 was a sub-orbital flight, sorry for the mistake! 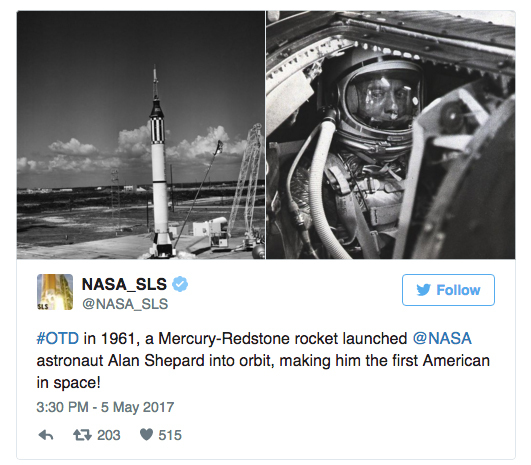 Continue reading SLS Social Media Folks Need A History Lesson (Update). By Keith Cowing on May 9, 2017 12:14 PM. National Space Council Announcements Soon? By Keith Cowing on May 9, 2017 12:01 PM. By Keith Cowing on May 9, 2017 12:00 PM. By Keith Cowing on May 9, 2017 11:17 AM. Acting #NASA Chief of Staff Shana Dale will be departing FAA - and NASA soon. We should all wish her well. She's a class act. By Keith Cowing on May 8, 2017 10:45 PM. "Passage to Mars" is a documentary about a bunch of guys who try to drive across a large frozen stretch of the Northwest Passage. They attempt this feat (in part) as an analog for long distance traverses people will one day attempt on Mars. This film depicts important lessons that are often far more relevant for the actual human exploration of Mars than anything NASA itself is doing right now. This unprecedented adventure, planned to last a few weeks ended up becoming a three-year epic odyssey of hope, fear and survival. The goal of the expedition was to use a specially-outfitted Humvee named the "Okarian" across 2,000 miles of sea ice. Their ultimate goal: to drive to Haughton Crater on Devon Island - the location of a NASA-funded research base where scientists and engineers learn how to live on and explore Mars." Keith's note: I was on a panel tonight with Penny Boston, Leonard David, and Pascal Lee at the Human to Mars Summit after a screening of the documentary "Passage to Mars" which features the exploits of the team responsible for the Haughton Mars Project on Devon Island. If you have not seen this film you can get it on iTunes and Amazon. By Keith Cowing on May 7, 2017 1:46 PM. "The X-37B Orbital Test Vehicle mission 4 (OTV-4), the Air Force's unmanned, reusable space plane, landed at NASA's Kennedy Space Center Shuttle Landing Facility May 7, 2017. "Today marks an incredibly exciting day for the 45th Space Wing as we continue to break barriers," said Brig. Gen. Wayne Monteith, the 45th SW commander. "Our team has been preparing for this event for several years, and I am extremely proud to see our hard work and dedication culminate in today's safe and successful landing of the X-37B." The OTV-4 conducted on-orbit experiments for 718 days during its mission, extending the total number of days spent on-orbit for the OTV program to 2,085 days." By Keith Cowing on May 5, 2017 4:30 PM. Keith's note: One planetary scientist is doing a systematic search for a large planet that may be lurking in the outermost reaches of our solar system. Meanwhile another planetary scientist who got his own mission to visit the farthest objects yet visited in our solar system just can't get over a nomenclature decision made a decade ago. @plutokiller @jccwrt Sorry bub. Tombaugh found the real planet 9 in 1930. Many more found since. Hope you find yours but You gotta get in line. By Keith Cowing on May 5, 2017 1:16 PM. "Thomas Lo Grossman, a tax attorney at the Franchise Tax Board, said the proposed rules are designed to mirror the ways taxes are levied on terrestrial transportation and logistics firms operating in California, like trucking or train companies. Those rules are based largely on the way California and other states calculate taxes when goods are shipped from one state to another. In what's known as a market-based approach, companies tally sales -- and then the taxes based on those sales -- in the state where the good or service is received. But in the borderlessness of space, precisely where a product gets delivered is difficult to define." "1. Mileage ratio numerator. The numerator of the mileage ratio for each launch contract shall be the total projected mileage that all launch vehicles launched or planned to be launched pursuant to that launch contract will travel within this state. If a launch occurs or is planned to occur in this state, the contribution of that launch to the numerator of the mileage ratio shall be 62 statutory miles. If a launch occurs or is planned to occur outside of this state, the contribution of that launch to the numerator of the mileage ratio shall be zero." Keith's note: This may seem silly - but stop and think for a moment: people are now treating space commerce as just another business thing that can be taxed. The space sector gets more "real" every day. By Keith Cowing on May 5, 2017 9:49 AM. 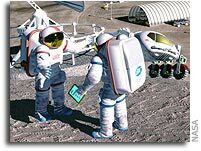 "NASA has identified a variety of exploration, science, and technology demonstration objectives that could be addressed by sending instruments, experiments, or other payloads to the lunar surface. To address these objectives as cost-effectively as possible, NASA may procure payloads and related commercial payload delivery services to the Moon. Such delivery services need to be consistent with the National Space Transportation Policy (NSTP). The NSTP requires U.S. Government primary and secondary payloads to use U.S.-manufactured launch vehicles. "Hosted payloads" that meet the hosted payload definition within the National Space Transportation Policy can fly as part of a mission using a foreign launch vehicle. As a first step, NASA is interested in assessing the availability of payload transit and delivery services from Earth to the Lunar surface as early as Fiscal Year 2018 and through the next decade. This approach offers NASA the potential to simultaneously address critical strategic objectives related to exploration, science, and technology demonstration using commercially provided domestic space services and hardware." By Keith Cowing on May 5, 2017 8:39 AM. Keith's 4 May update: @DanaPerino deleted this tweet (but it is still on her Instagram page). Why would she do that - unless she did something wrong? This is what the tweet looked like - before it was deleted. Keith's 5 May update: Now @Astro2fish has deleted his tweet as well. Why would he do that - unless he also did something wrong? This is what the tweet looked like - before it was deleted. The only reason that the text of these embedded tweets still appears is that I embedded them before deletion and the words are in the embed code. If you click on the date/time you will get a deletion message. This is what they both looked like - with pictures - before Dana Perino and Jack Fischer deleted them. "- Is there a Space Act Agreement or MOU in place between NASA and Dana Perino and/or Fox News that allows a NASA civil servant on board the ISS to use their NASA position and work place to promote Dana Perino's book? - Can you provide me with a copy of the official NASA process whereby book authors/publishers can apply to have astronauts conduct promotional activities while aboard the ISS? Have other book authors applied for this promotion aboard ISS? - Did the NASA OGC at JSC or NASA HQ issue a waiver and/or give formal written permission to Jack Fischer to conduct these commercial promotion activities with Dana Perino and Fox News while on board the ISS? - Under what payload allocation was the "Felt Jasper" flown to the ISS? Did Jack Fischer carry it with him on his Soyuz flight or was this launched on a cargo vehicle? Is this a personal item or is it a NASA PAO-endorsed activity? 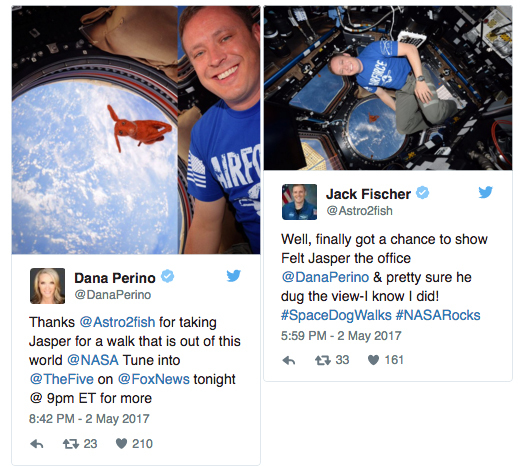 - Did NASA PAO interact directly with Fox News to coordinate the coverage given on Dana Perino's Twitter account and/or provide NASA imagery of the Felt Jasper on "The Five" segment that aired last night on Fox News? - What will be done with the Felt Jasper that Fischer has in orbit? Will it be returned to Earth and used for commercial purposes? - Will Jack Fischer and Dana Perino be doing any further commercial promotion activities for Perino's book on-orbit or when he returns to Earth? - Did Jack Fischer personally send the following tweet from the ISS? If he did not, who sent it? 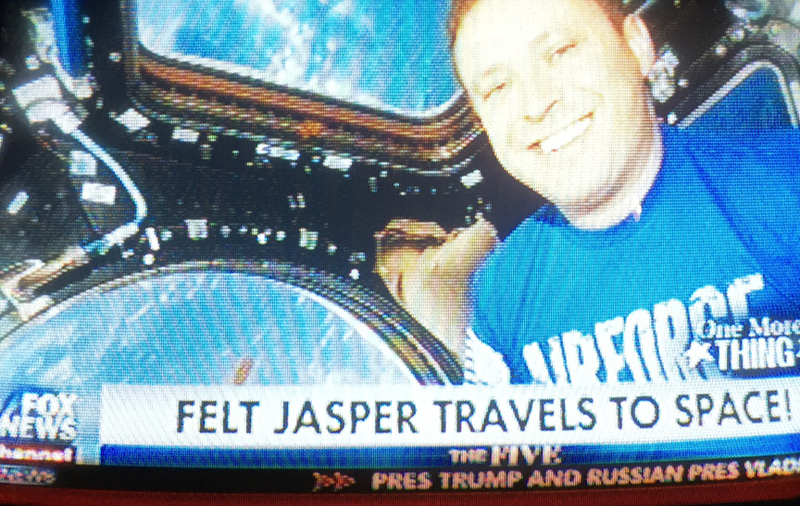 "@Astro2fish Well, finally got a chance to show Felt Jasper the office @DanaPerino & pretty sure he dug the view-I know I did! #SpaceDogWalks #NASARocks 5:59 PM - 2 May 2017"
"Hi Keith, Astronauts are permitted to take personal mementos to space. 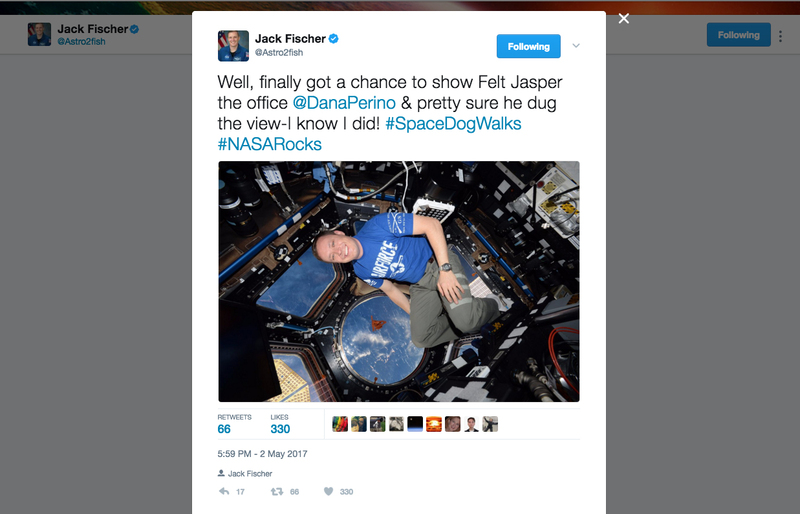 Jack Fischer's flight of a "Felt Jasper" as a personal memento and his subsequent release of imagery of that memento via his social media does not imply an endorsement of any commercial activity. Thank you, Jenny, Norma Jennifer Knotts, Public Affairs Specialist"
Apparently Trumpish commercial endorsement behavior is the new normal at NASA. An astronaut is allowed to use his official government position and work place to give significant social media visibility to a book written by a former Bush press spokesperson who appears on the President's favorite news channel (Fox). And that visibility is repeated on Fox News. Yet none of the Trump political appointees on the 9th floor at NASA HQ see anything wrong with this and are OK with a two sentence non-response. Tick tock. 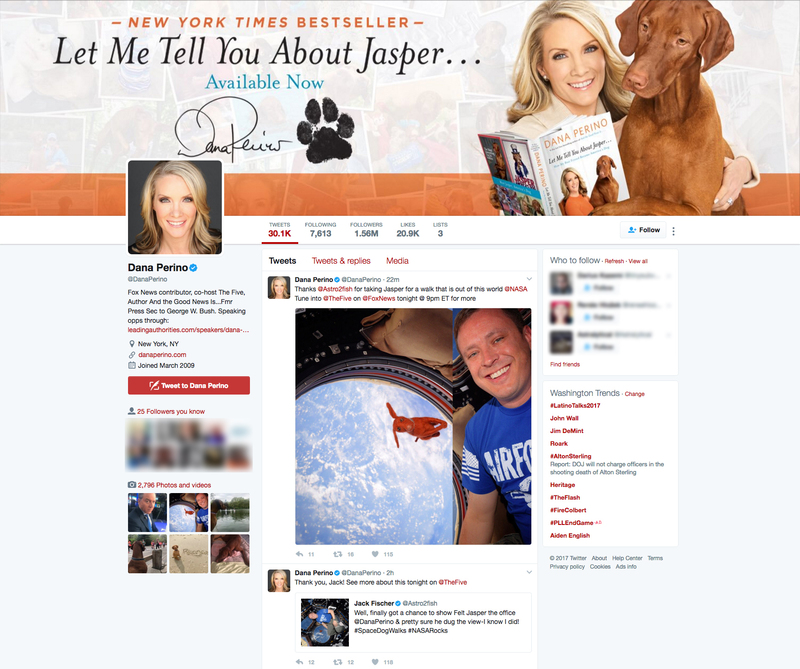 Keith's 2 May note: Now it is apparently acceptable for NASA astronauts to do on-orbit promotion tie-ins for books written by Fox News celebrities like @DanaPerino who has a book out titled "Let me tell you about Jasper". Since Fischer has the mini-Jasper in orbit this promotion had to have planned this ahead of time. How much did Perino pay for this - or did NASA give this orbital PR away for free? Check out her Twitter banner. This a rather overt tie-in. Apparently Fischer and Perino already knew each other prior to his departure - here he is holding a copy of her book at some event they both attended. The "felt Jasper" is something that is used to promote Perino's book. 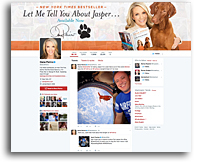 Keith's update: Fox Five just aired a piece about the Felt Jasper book promotion dog in space and Perino's book. Of course all of this PR and product promotion stuff was coordinated and approved by NASA PAO, right? By Keith Cowing on May 3, 2017 9:44 PM. "This successful flight test represents Vector's next technical milestone of the Vector-R launch vehicle. The flight test, which took place in Mojave, Calif. on May 3, featured Vector's first stage 5K-lbf engine and 3D additive manufacturing printed injector, which was successfully tested in December 2016, and developed in partnership with NASA's Flight Opportunities Program." By Keith Cowing on May 1, 2017 7:55 PM.
" ... $1.9 billion for NASA's Earth-science research programme, roughly equal to the 2016 level. The bill includes support for the Pre-Aerosol, Clouds, and Ocean Ecosystem satellite mission that Trump wants to eliminate. $1.9 billion for planetary science at NASA, an increase of roughly $300 million from the 2016 level. That includes $275 million for a mission to Jupiter's moon Europa, including a lander. The bill would set aside $408 million for the Mars 2020 mission - and give NASA the green-light to investigate the possibility of sending a helicopter to the red planet." "The bill includes full Appropriations legislation and funding for the remaining 11 annual Appropriations bills through the end of the fiscal year, September 30, 2017. This level meets the base discretionary spending caps provided by the Bipartisan Budget Act of 2015, and provides additional funding for national defense, border security, and other emergency needs." "NASA is funded at $19.7 billion in the bill, $368 million above the fiscal year 2016 enacted level." Keith's note: This is the FY 2017 omnibus spending bill that covers current fiscal year spending and replaces the Continuing Resolution that governed spending at FY 2016 levels - until now. But FY 2018 starts in 5 months. What form NASA's budget will take in Trump's proposed FY 2018 budget is not clear at this point since this bill reverses (in a major way) nearly everything cut in Trump's budget proposal ("skinny budget") issued earlier this year. When you consider that Rep. Culberson has reiterated his support for two Europa missions each (presumably) launched on a SLS, that SLS continues to slip to the right and has inadequate reserves, and that Gingrich/Walker comments today about SLS speak to doubts within the Trump Administration about its survival, there is certain to be a SLS food fight at some point in the not too distant future. No doubt the future of SLS will be linked to what direction the White House wants to go in space - and how NASA will be directed to participate - or told to let others do some of the heavy lifting. By Keith Cowing on May 1, 2017 3:17 PM. By Keith Cowing on May 1, 2017 3:11 PM. By Marc Boucher on May 1, 2017 7:49 AM. "SpaceX launched a spy satellite for the U.S. National Reconnaissance Office (NRO) early this morning after a one day delay. The launch appears to have placed the secret payload into a low earth orbit. SpaceX also successfully landed the first stage of the Falcon 9 rocket." Marc's note: The video portion showing the return of the first stage is quite spectacular, providing views we haven't seen in this detail before. It starts around the 24 minute mark.